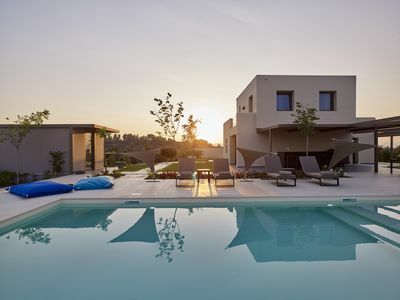 ★ The estate encompasses 35’000 m2 of land. ★ The views surrounding the estate are spectacular and picture-perfect. ★ There are two private beaches, one on each side of the cape. 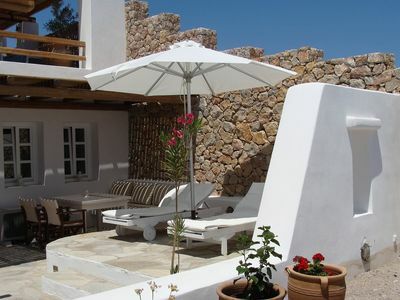 ★ The home's attractive architectural exterior is reminiscent of a traditional Spetses mansion. ★ The interiors are the ultimate in modern luxury, design, and comfort. 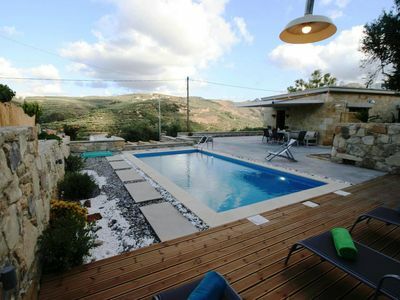 ★ The estate is situated on the southwest end of the island. ★ The home has been constructed using only high-end finishes and constructed to the highest of industry standards. ★ The 200 m2 private pool is surrounded by 6’000 m2 of beautifully landscaped gardens and includes both native and exotic plantings. 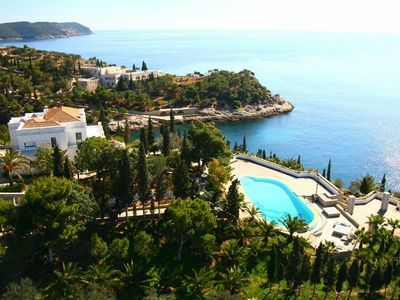 ★ Spetses is one of the most cosmopolitan, affluent, and jet-set popular Greek islands easily reached from Athens. 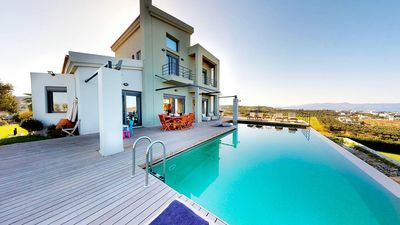 This is a three-level luxurious villa with an exceptional location on this very private estate property. The construction is unparalleled in quality and finish. The walls are made of 80 cm. 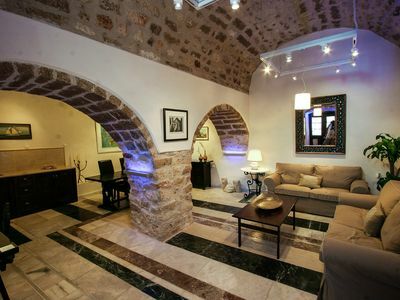 thick stone in style reminiscent of traditional Spetses architecture. The floors throughout the house are made out of “Pendeli” marble (same as the “Parthenon” is made out of ), hardwood, granite. Everything about this main house is of the highest standards. 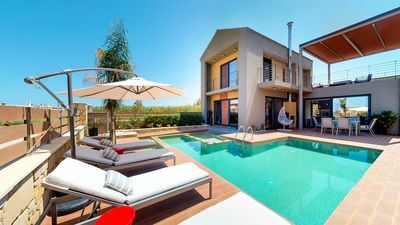 There are three spacious and luxurious bedroom suites on the first floor, each with its own bathroom and large sitting area for the ultimate in comfort, relaxation, and privacy. Each bedroom is elegantly appointed with beautiful furnishings and top-quality linens and exquisite decor. All of the bathrooms are large and elegantly finished. Each contains both a toilet and a bidet. 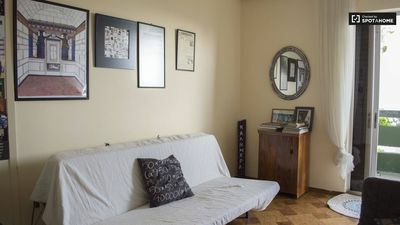 The guest apartment is a self-contained space within the main house comprised of a living room, kitchen, and bathroom. The living room is an ideal area for convening and entertaining. It is a beautifully appointed and large expanse in the center of the home that comfortably and elegantly accommodates guests. The dining room is an equally well-appointed space adjacent to the living areas of the home. There are two fireplaces throughout the home. The sleek, contemporary chef's kitchen is impressive and quite large by most standards. It is fully equipped to allow for meal preparation at any level or quantity. You will not struggle to find space in this kitchen as there's plenty of it through great attention to detail in its layout and design. The most discerning of chefs would be thrilled to prepare a meal and all of the appliances are high-end and professional quality. A full bank of windows along an exterior wall fill the space with light and adds a touch of old-world elegance to this otherwise modern space. Garage: There is indoor private parking for three vehicles. Here you will also find the washer and dryer as well as an ironing area. The stunning swimming pool with water massage area. (The pool chemical maintenance is fully automated and regulated for Chlorine, PH, and anti-algae.) Nearby, guests can make use of a WC, shower, and pool storage area. 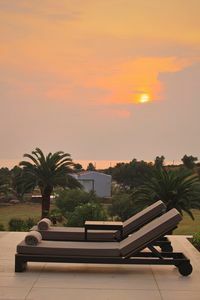 You'll find it difficult to leave your poolside chair with its spectacular views stretching as far as the eye can see. The out toward the ocean and the private island of the famous billionaire Niarchos family. Why go to a public beach when you can enjoy the luxury of a private beach just for you and your guests? There are actually two private beaches on the estate, one on each side of the promontory the house sits atop. Both are a short walking distance from the main house. 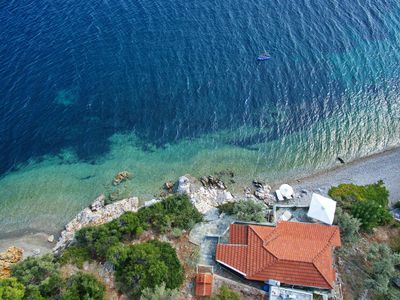 The beaches are small pebble and sandy while the water is the iconic Greek turquoise, crystal-clear and top quality. Not many Airbnb rentals come with a large private dock able to accommodate two large yachts. 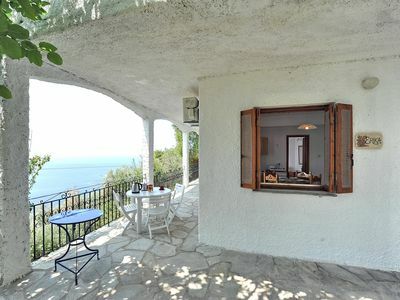 There is a seaside kiosk/cabana (20 m2) with all of the comforts - and that you would expect from a home of this caliber! The surrounding landscape on the property feels like a private park and tree grove and includes over 700 Olive trees (for olive oil production), Phoenix variety trees (Palm Trees, Cycas, Chamaerops, Dactylifera, Yucca); a grape yard for wine production; peach, blackberry, fig, lemon, orange, and mandarin trees are planted throughout the property. ★ While you might feel like you are far away from the rest of the world, you’ll actually not so far. It’s not difficult to get to Spetses - and it’s well worth the visit. Although there is no airport on Spetses, the nearest one is the international airport of Athens. 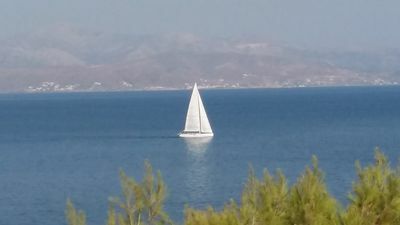 You can get to the island relatively easily from Athens via the port of Piraeus (15 minutes from Athens). Ferries or high-speed hydrofoils depart regularly from there and deposit you on the island just 3 hours later (you will enjoy the views along the way). 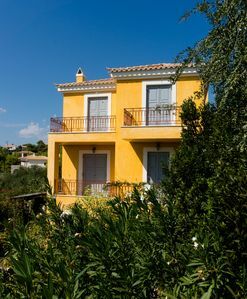 ★ Spetses' history dates back to 8,000 BC, and today it is one of Greece's most an affluent islands. 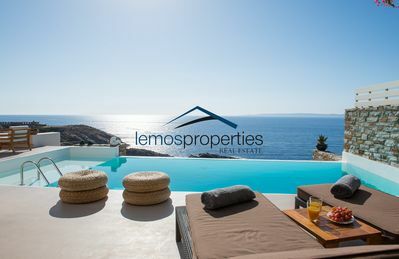 It is often characterized as being one of the Saronic Islands. One of its most charming and unique aspects is that private automobiles are not allowed within the town limits. Instead, residents and tourists alike walk or make use of horse-drawn carriages, bicycles, mopeds, or motorcycles. The only vehicles allowed in the city are taxis and delivery vehicles. ★ Cathedral of Ayios Nikolaos, the island's Independence flag was raised here on 3rd April 1821. ★ Every April there are various athletic events known as "Spetsathlon" )the biggest triathlon in Greece) and in October it's the "Spetses Mini Marathon". ★ Ayioi Anargyroi: One of the largest nearby beaches also on the southwest end of the island. It offers water sports. ★ Ayia Paraskevi: A sandy beach on the west part of the island about 12 km away from Dápia. Water sport facilities are also available. 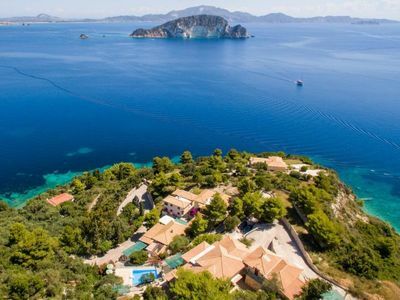 ★ Ayia Marina: This is the most famous beach on the island! It's sandy, with many beach bars and restaurants. Water sports available. ★ Xylokériza: A secluded beach 8 km from Dapia on the south-eastern part of the island, mainly accessible by boat. 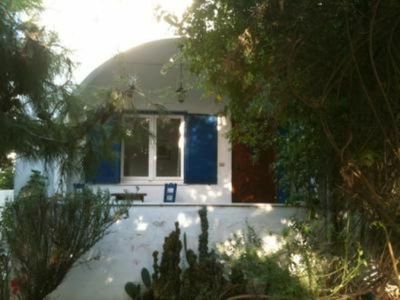 ★ Vréllos: A beautiful sandy beach on the west side surrounded by a dense pine forest. Villa ERIKA+VERONICA. Private access to the sea. Privileged view of the Egean. 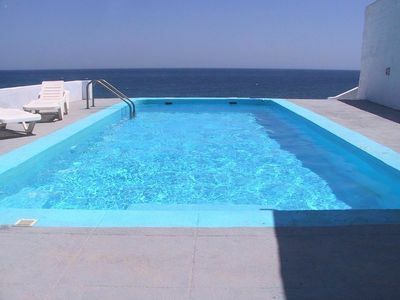 Beautiful penthouse - Cheap, chic & close to the beach! 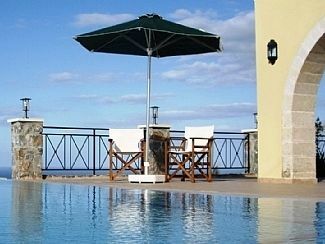 Villa Sorokos, in private complex in Santorini, 1 bedroom, 3 sleeps.